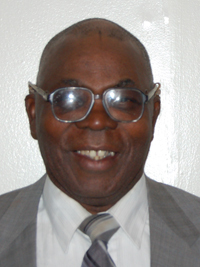 Joe coached for thirty years at Delaware State University, producing dozens of championship athletes. His teams won MEAC team championships, indoors in ’83, ’84, ’86, and ’87 and outdoors in ’76 and ’92. Each time he was named the MEAC Outstanding Tournament Coach. He also received the award in 1981. Joe coached two previous inductees, Brad Morris and Mike Wilson. Brad Morris was DSU’s first All-American, earning the honor for the 440yd. Dash in 1974 and 1975. Mike Wilson holds the MEAC all-time one and two mile run records. Other athletes Joe has coached still hold nine MEAC records and eight MEAC records held by his athletes have since been broken. Joe was a star athlete at I.C. Norcum High School in Portsmouth, VA. He still holds the VA state record with 31 touchdowns and 192 points in a season. He was the first high school African American All-American from Virginia . He was a four-year letterman in football at Iowa State. He coached football and track & field at Delaware State.